Don't skip this article T-Mobile subscribers, this is one of the best deals I have come across for quite some time. T-Mobile has discounted the very capable and well-regarded LG V20 to just $360, down from $769. We were excited about this phone going on sale for $500 just a couple of days ago, and this is a way better deal! 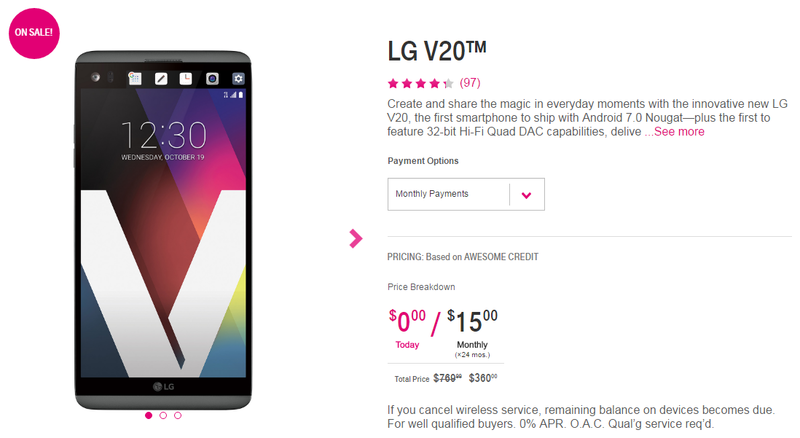 On top of a killer price, LG has a separate promotion running for people who purchase an LG V20 (or G5) through T-Mobile. Buy one, and submit your receipt through their promotion website and they'll mail you a free 720p LG MiniBeam portable projector which sells for $350 on Amazon. Now for some important notes. The projector promotion has been running since February 10th, and today is its last day. If you want to cash in on the freebie you must purchase the V20 today, receipts with a later date will not qualify. At the risk of sounding like a used car salesman, I'm going to shout at you, act NOW! The only other stipulation that you need to be aware of is that the phone must be purchased on a T-Mobile plan, you can't just buy it outright. The projector is legitimately a sweet device, with a 720p output capable of casting up to a 100 inch screen. It has a built-in battery for up to 2.5 hours of cord-free viewing, HDMI input, and audio out via Bluetooth. With only 130 lumens of light output it won't be much good in daylight, but it should work great in a dark environment. My wife has needed to replace her ailing Sony Z3 for several months, and I've been looking for the right deal to pop up to lure me into a purchase. This is the one I've been waiting for. I'm hopping on this promotion as soon as I finish typing the article, and I imagine a lot of you will be too. To take advantage of the offer, head over to T-Mobile to buy the V20 today. Then, after your phone arrives, go to LG's T-Mobile promotion website to fill out the offer redemption form before March 22nd. In about six weeks they'll mail you your free projector.